A monument commemorates all those who are buried in the cemetery. 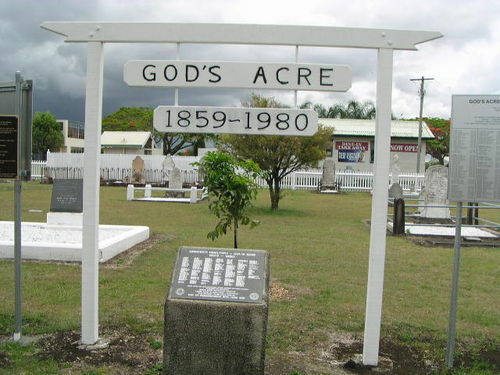 God`s Acre is situated at the main entrance to Archerfield Aerodrome. The site was dedicated as a cemetery when Volney Grenier, aged 16, was killed in a fall from his horse during a fox hunt on 26 October 1859. His grieving parents, Thomas and Mary Ann Grenier, buried him at this site and set aside a small area of 3/4 acre from their property as a family cemetery. The last burial in the cemetery was for Miss Olive Grenier who was buried on 16 July 1980. The carved Memorial sign is a gift from the Parker family, and Ron Parker created the sign for the God`s Acre Restoration Committee. The obelisk holds a brass plaque on which is inscribed the names of all those people who are interred in God`s Acre.